Sclera: The knowledge of eye parts and functions is both useful and interesting. The white part of our eyes is known as sclera. It consists of fibrous tissues. The job of this part it to protect the internal parts of the eye. Cornea: The transparent tissue through which light enters the eyes is called cornea. It exists in front of the eye. That is why, it looks prominent among different parts of the human eye. Iris: Iris is made up of muscles which contract or relax in order to adjust the amount of light which enters the eye. Pupil: There are many interesting facts about the pupil. It is, actually, an aperture controlled by the iris muscles. For instance, when it is dark, the iris muscles relax, causing the pupil to open up wider. Therefore, more light enters the eyes to enable us to see better. On the other hand, the pupil becomes narrow due to the contraction of the iris muscles. It occurs in the presence of excessive light in order to protect the cells of the eyes. Lens: The lens is present behind the pupil. Light enters the pupil, passes through the lens and is focused on the retina of the eye. The lens is capable of changing its shape in order to help us see near or far off objects. This is about how the human eye works. Retina: Digging further deeper into the human eye anatomy, you will come across the retina. The retina converts light into electrical signals which are transferred to the brain for processing. The retina contains two types of cells: rods and cones. These cells are sensitive to light. Rods are important for night-time vision when there is little light. On the other hand, cones play an important role in helping us see colors. Optic Nerve: The optic nerve takes electrical signals from the retina of the eye to the brain. The Human eye works on the refraction of light through a natural convex lens made up of transparent living material and enables us to see things around us. And the ability to see is called vision, eyesight or drishti. Human eye consists of cornea, iris, pupil, ciliary muscles, eye lens, retina and optical nerve. The front part of the eye called cornea, is made of transparent substance and its outer surface is convex in shape. It is through cornea that the light coming from objects enters the eyes. Just behind the cornea is iris which is also called coloured diaphragm. A hole in the middle of the iris is called pupil. Then behind it is the eye lens which is a convex lens. It is due to the support of ciliary muscles that the eye lens is held in position. 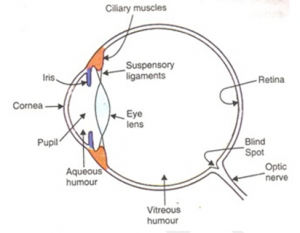 Eye lens is flexible and thus can change its focal length and shape with the help of ciliary muscles. Behind the eye lens is retina on which the image is formed in the eye.